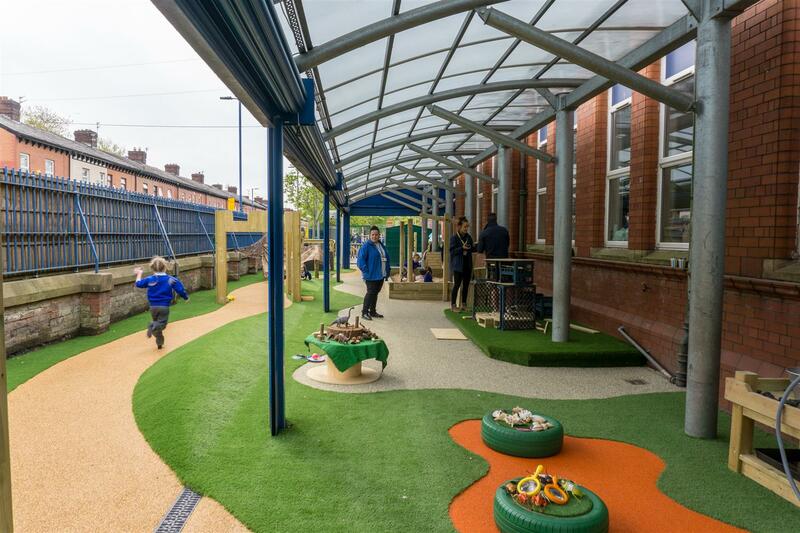 Our Playground Consultant, Megan Booth, met with Rebecca Payne, Assistant Principal and EYFS Leader at Seymour Road Academy in Manchester, to discuss new plans for their early years playground. 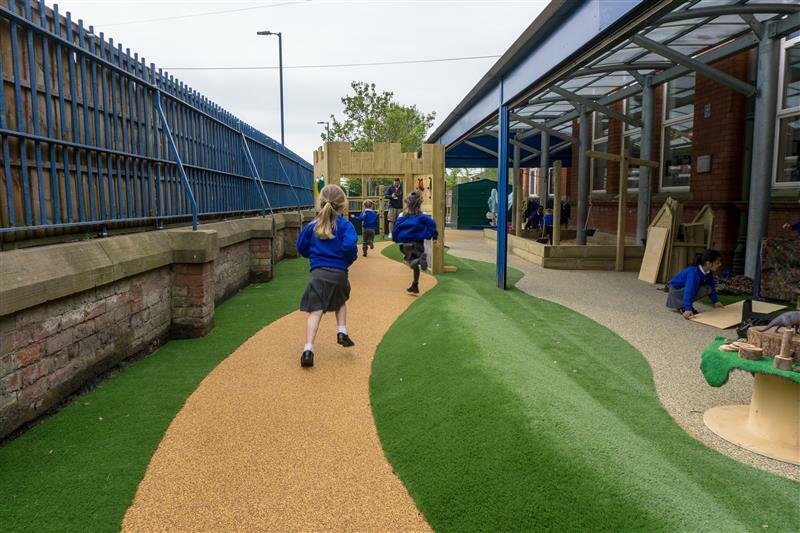 Following the initial consultation, we drew up a design for a complete overhaul of the existing space to allow development of the 7 areas of learning. 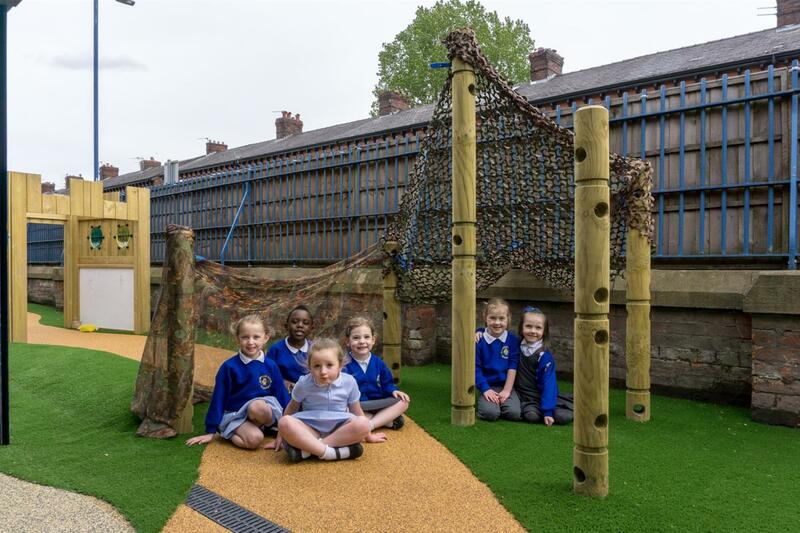 The newly developed outdoor space breathes new life along the entire length of the early years playground space at Seymour Road! 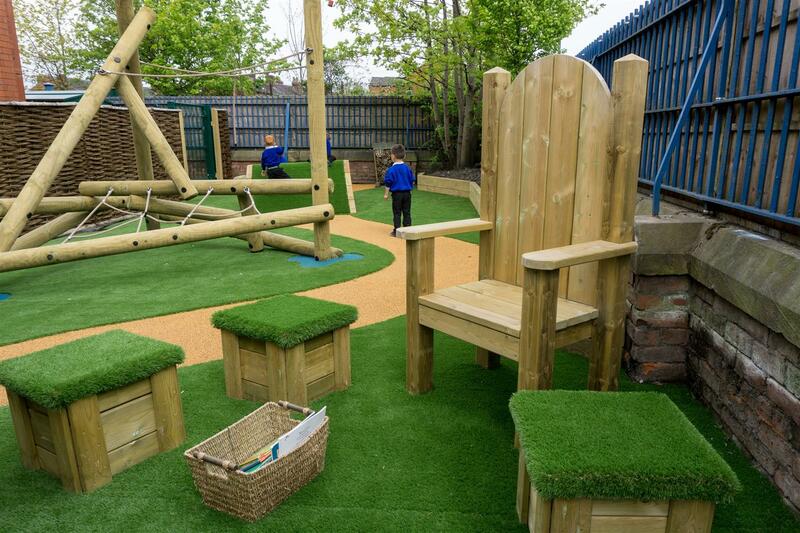 We designated the area into different zones for storytelling, messy play, imagination and discovery, mark making, role play and physical development. 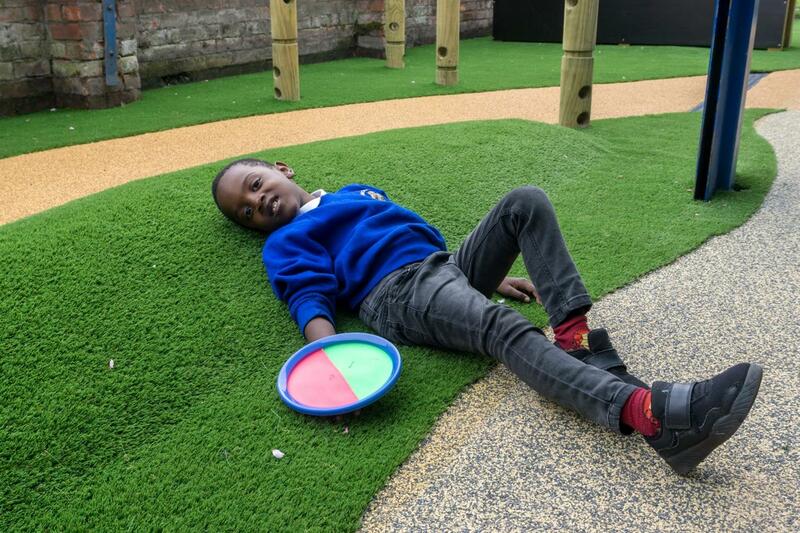 Our design for the new playground surface makes clever use of different coloured Playturf, Saferturf and Wetpour Safety Surfacing to designate different zones and areas, providing a really exciting and varied play space for the children. 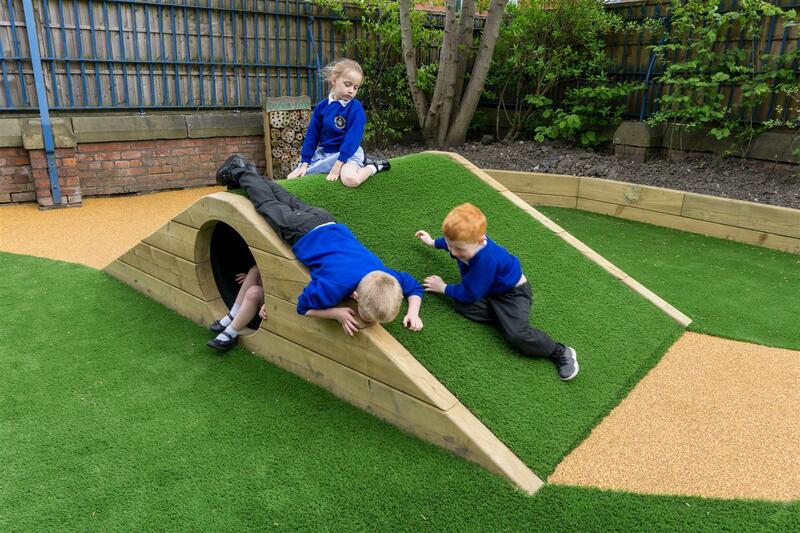 The mixture of blue, green, beige and terracotta, big bold splashes of colour, makes the play space really intriguing. 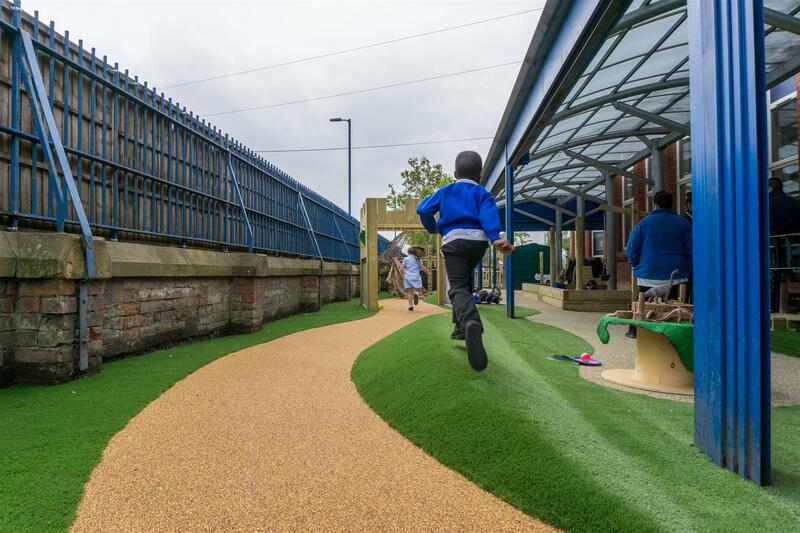 A sandy coloured pathway winding its way between the zones, leading the children from one to another, connects the areas together beautifully. We used contouring to create a Landscape Hill, creating an element of physical challenge in itself. 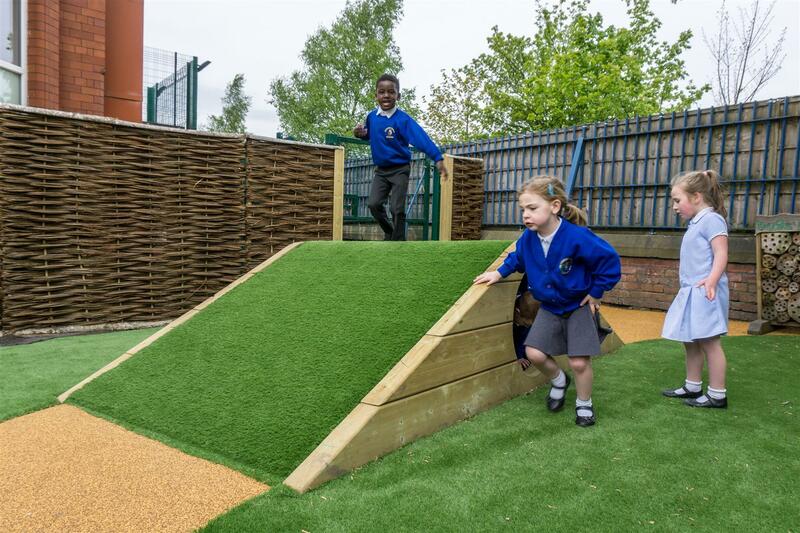 Between the playground and the perimeter fencing, we installed a lovely deep timber sleeper border. This creates a naturally attractive barrier between the playground and the roadside, which is all ready for planting, gardening, and sensory outdoor learning. 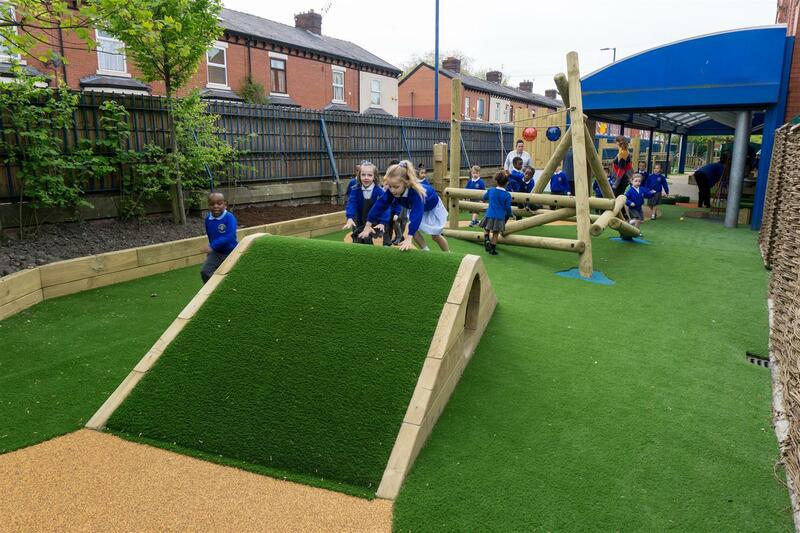 We pride ourselves on knowing how to make the most out of every playground and outdoor learning space, whatever size and shape it may be. 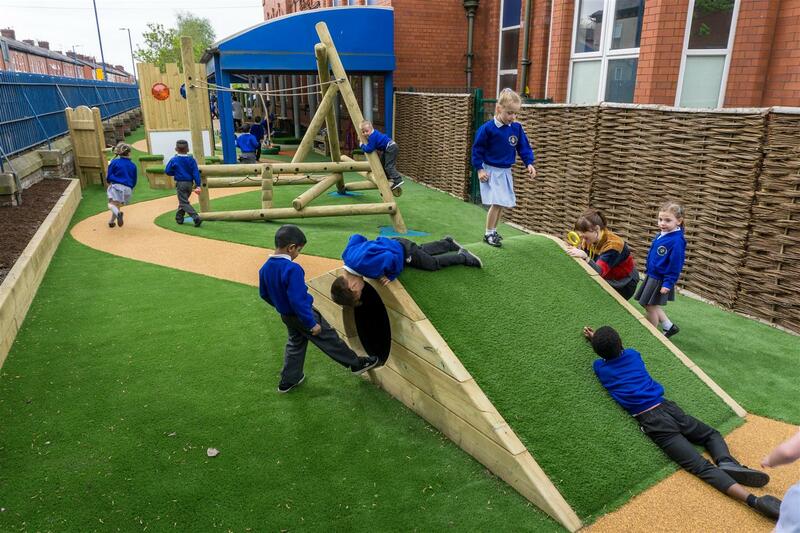 Clever use of even the most awkward of nooks and crannies can really maximize learning and play opportunities for a school or nursery. 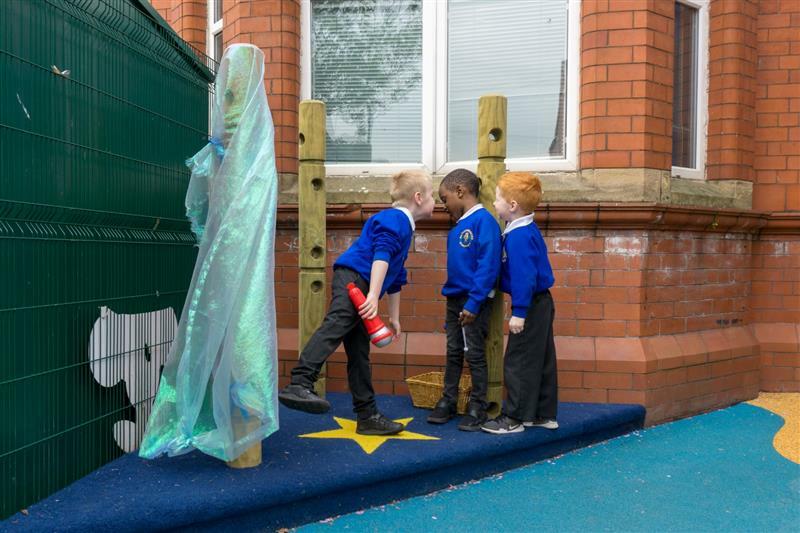 At Seymour Road, we have transformed an unused triangular corner space between the school building and the fence, to turn it into a perfect Performing Arts space! 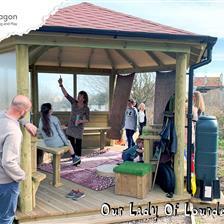 A deep blue bespoke triangular Performance Stage, with 3 Den Posts to allow children to design their own scenery, or even turn the space into a cosy den for outdoor reading and role play, offers open-ended opportunities for this unique space. 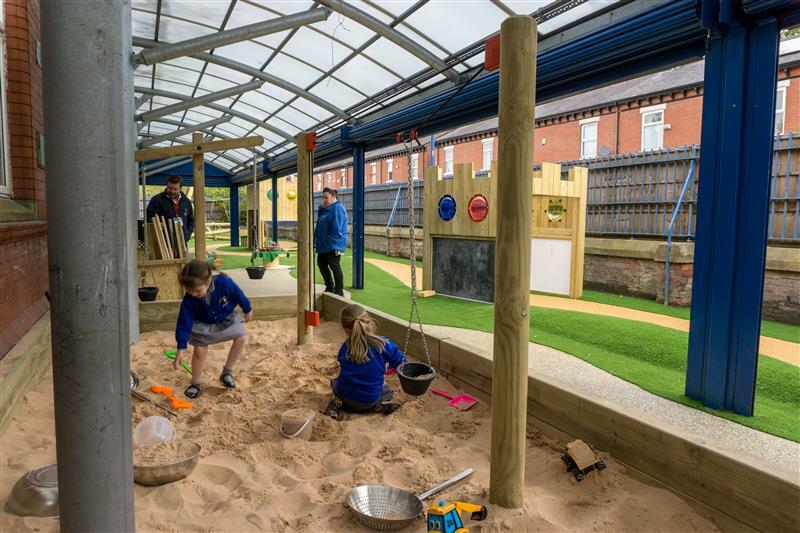 We installed a giant Sand Pit at Seymour Road with a Rope and Pulley Materials Mover and a set of Timber Weighing Scales standing inside it. 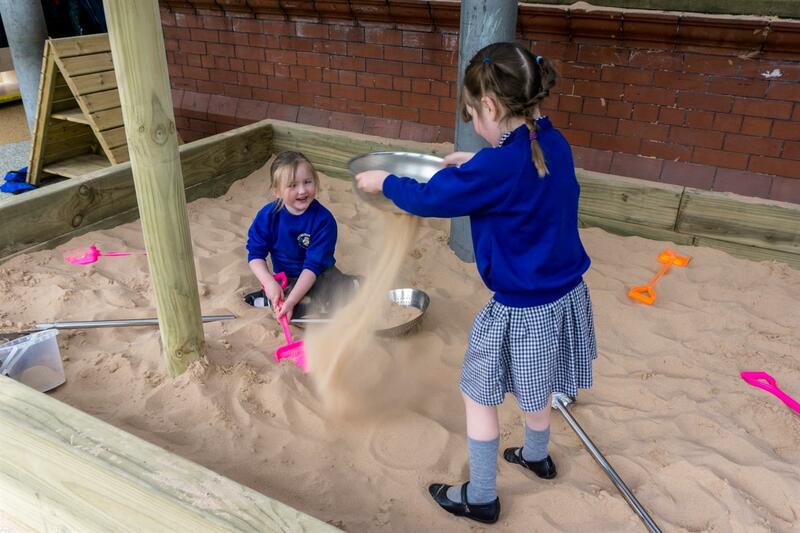 It’s all under cover so the children can enjoy playing in the sand all throughout the year, investigating all the different things that they can do with it, measuring and experimenting with weights, gravity, distance and speed, working gross motor skills as they move the sand and equipment and around. 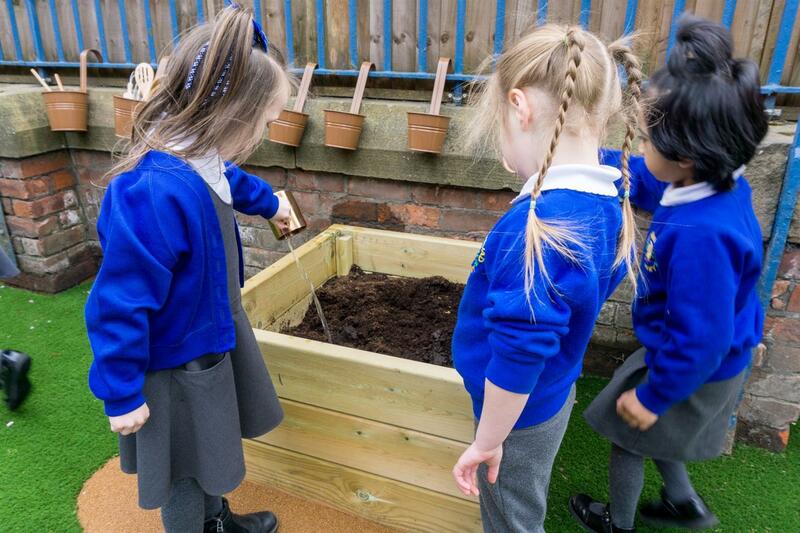 They have been using sieves, colanders, and other household items to manipulate the sand and generally have a lot of fun with it learning as they play! 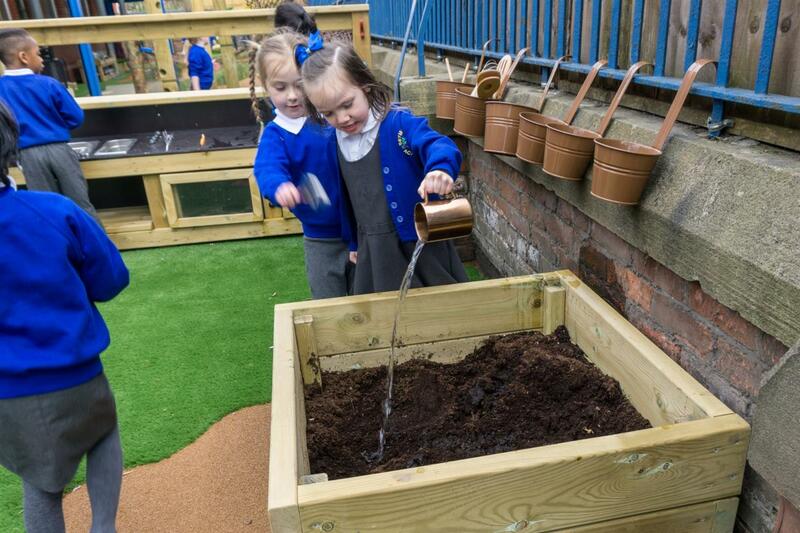 A super new Mud Kitchen has opened the doors for endless open messy play and role play at Seymour Road - they even have a Mud Box with a section for mud and a section for sand to ensure a plentiful supply of materials to get creating with at all times. 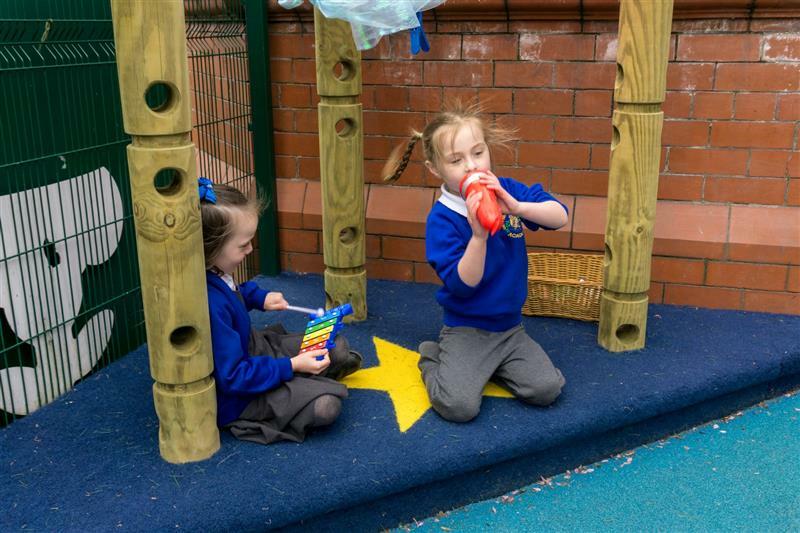 Added to this fabulous messy zone, a Quarry Mixing Station has been well equipped with all sorts of tubes, metal urns and pails for experimenting and concocting potions! 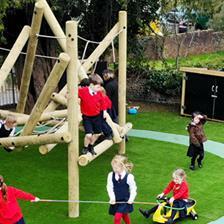 View our full range of Imaginative and Creative Playground Equipment here. 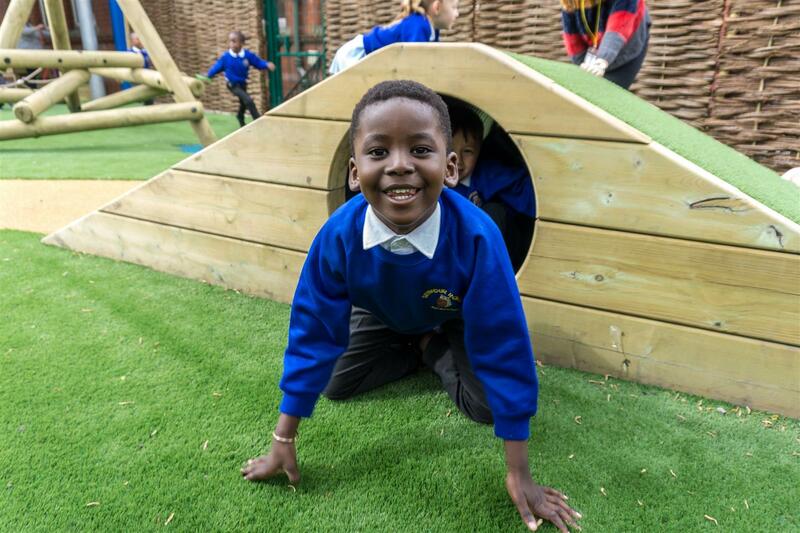 The children have covered their new Den Making Posts with a camouflage net to create an inviting base for imaginary play. 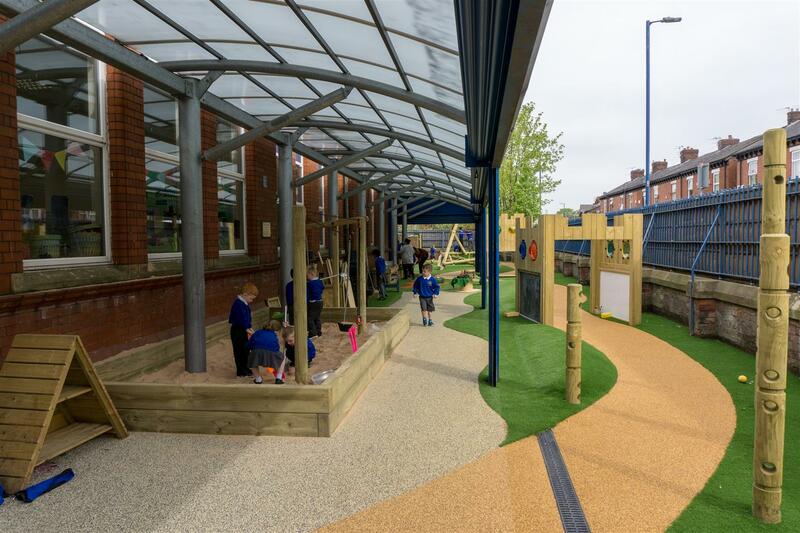 The bespoke Decked Small World Space and Trellis Walkway with Bubble Windows creates a magical free flow imaginary play space which is inclusive and welcoming to all EYFS children. 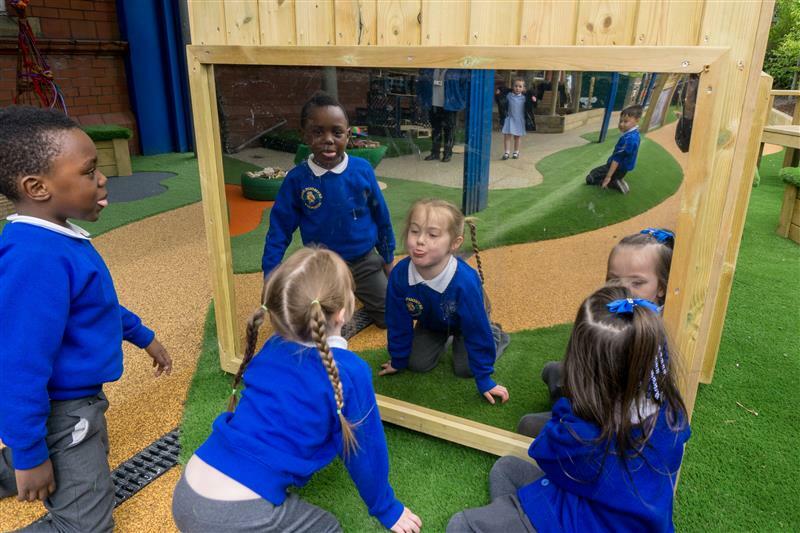 It includes bubble windows that look brilliant in different colours, reflecting light patterns and offering different perspectives as the children peer through them. 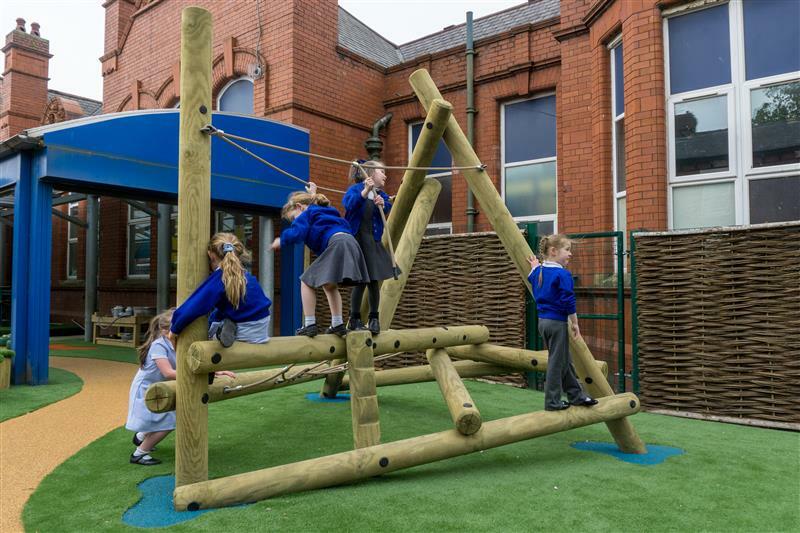 There’s a durable timber Construction Table which allows teaching staff to set out a range of small world and construction toys for children to play creatively and use their fine motor skills. 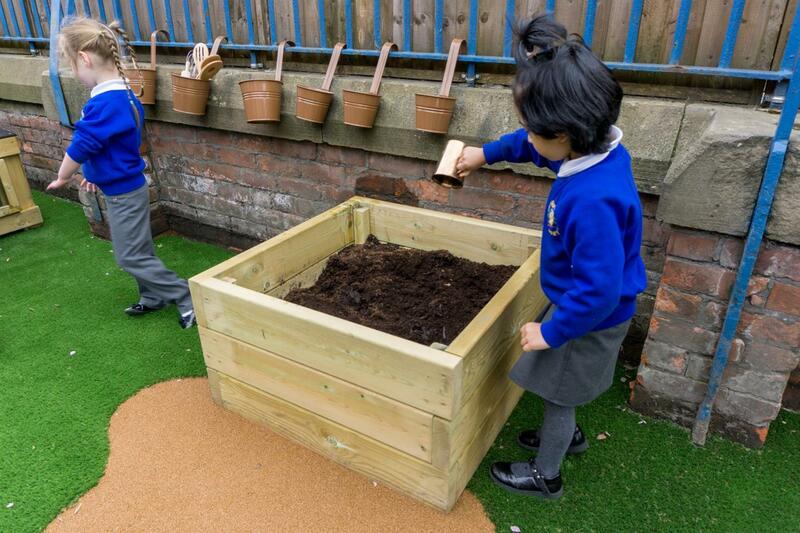 The addition of a Double Sided Whiteboard and Double Sided Chalkboard encourages mark making activities as an element of play. 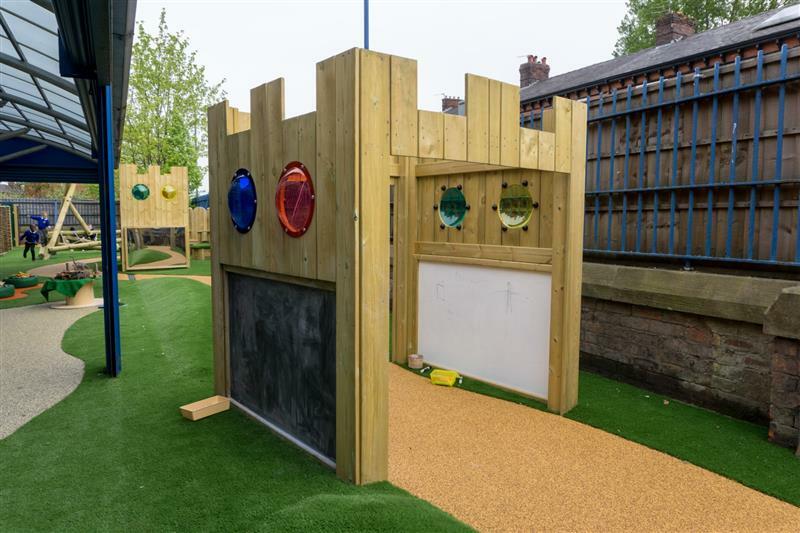 We created a beautiful fairytale play area, perfect for outdoor reading and bringing stories to life, with a bespoke timber Fort with Bubble Windows. 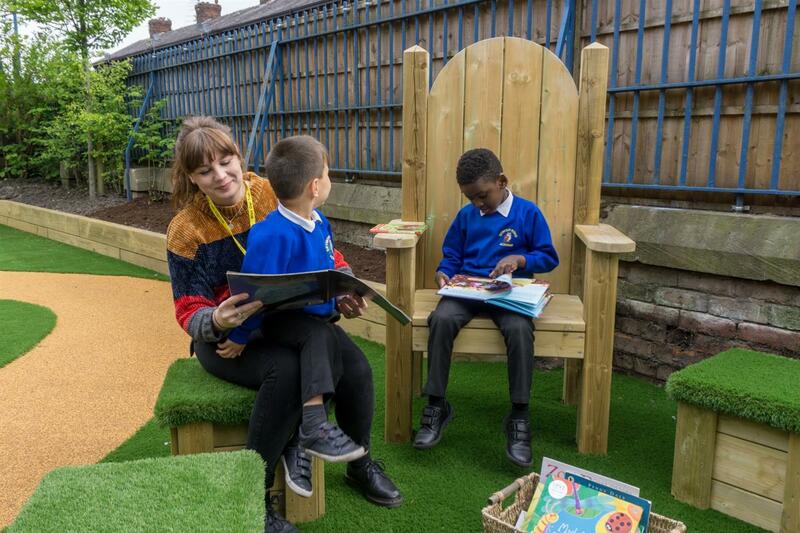 A Giant Story Telling Chair surrounded by Small Moveable Artificial Grass-Topped Seats allows children to sit together in a cosy group, taking it in turns to sit on the “throne” and read aloud. 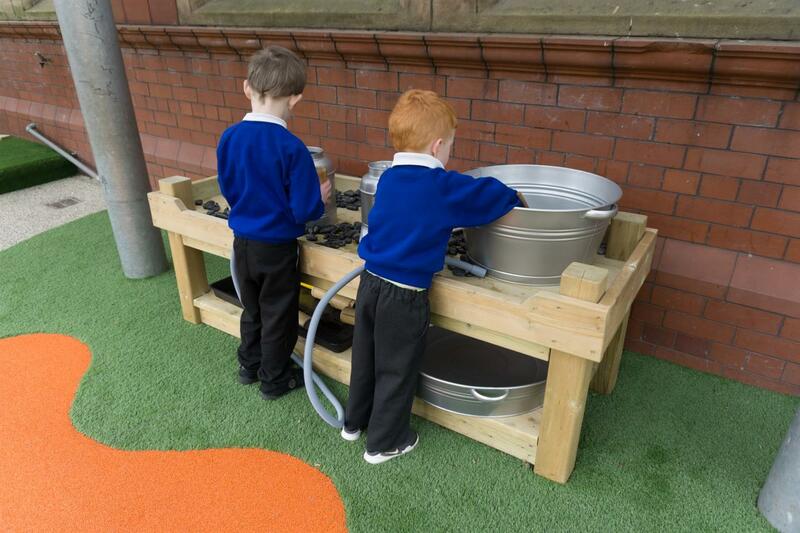 A Giant Chalkboard and Giant Whiteboard for mark making enhance the literacy element of this special area. The Giant Mirror has been really popular with children observing their reflections, watching what they can do with their bodies and seeing what reactions they can get, exploring and having fun. 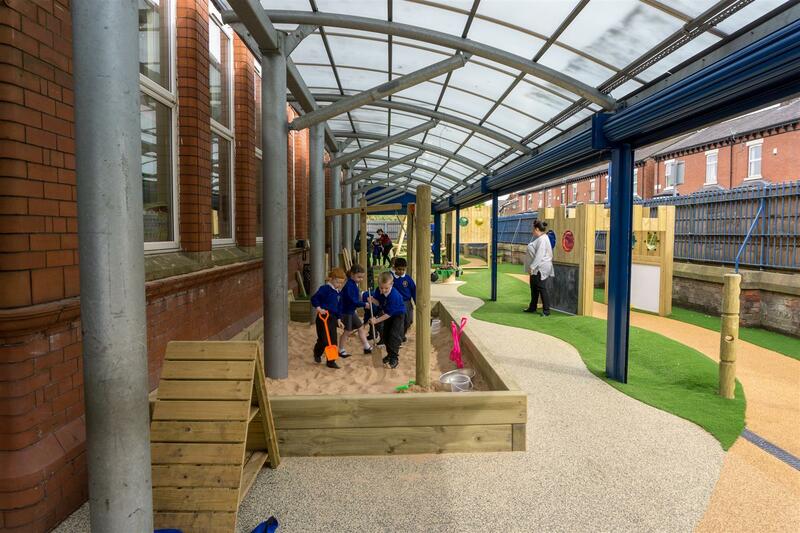 It creates an illusion of space, reflects light and allows the children to observe the play space at different angles. 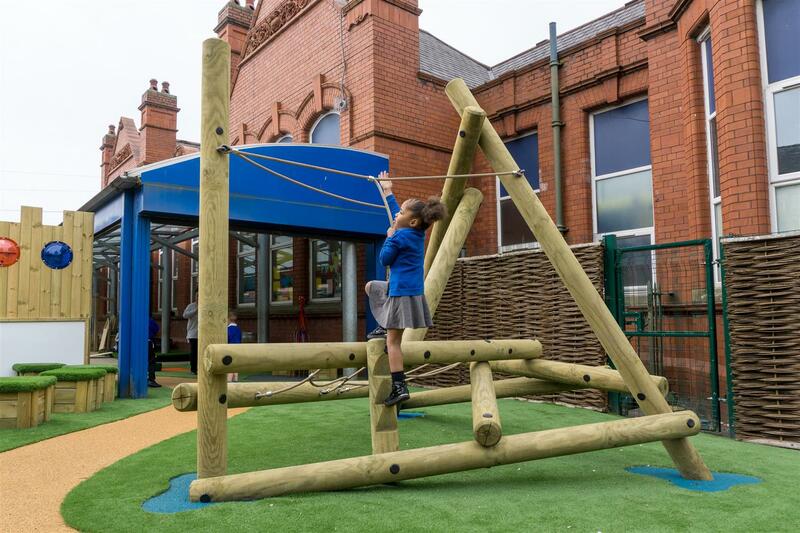 Our Harter Fell Climber is a triangular log and rope climbing frame that offers flexible, multiple climbing routes, and a non-prescriptive design that allows children to play in their own ways. Great for building physical confidence, developing upper and lower body strength, improving core stability and balance. A Climb Through Tunnel Hill provides a brilliant look-out point as children climb up to the top of the foam-cushioned hill, and then roll back down again. 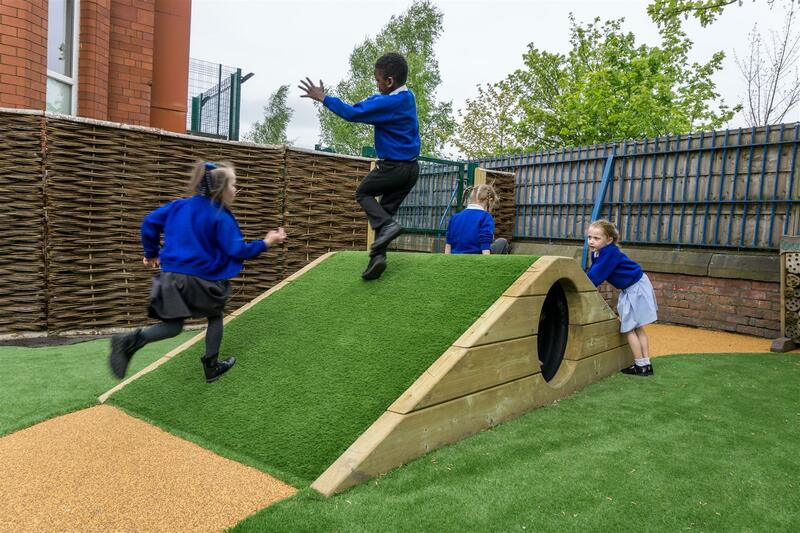 View our full range of Active Playground Equipment here. 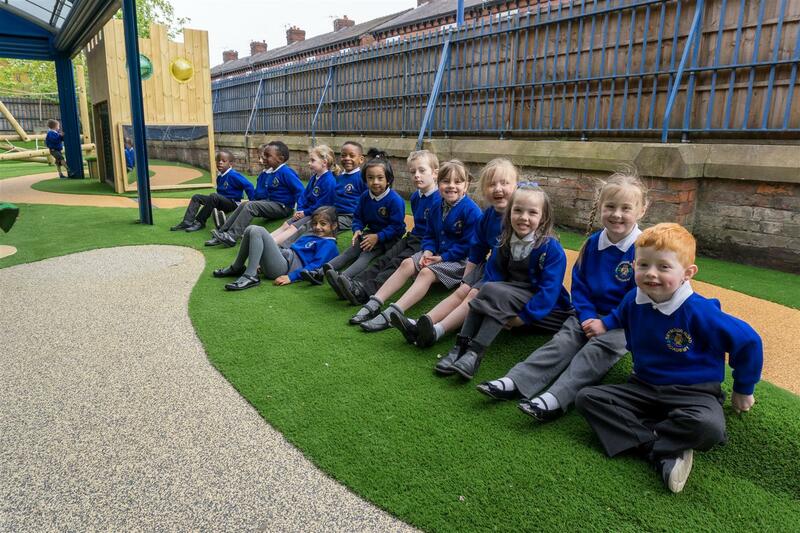 When Seymour Road opened their new early years playground, the children were so excited to see their new learning space! 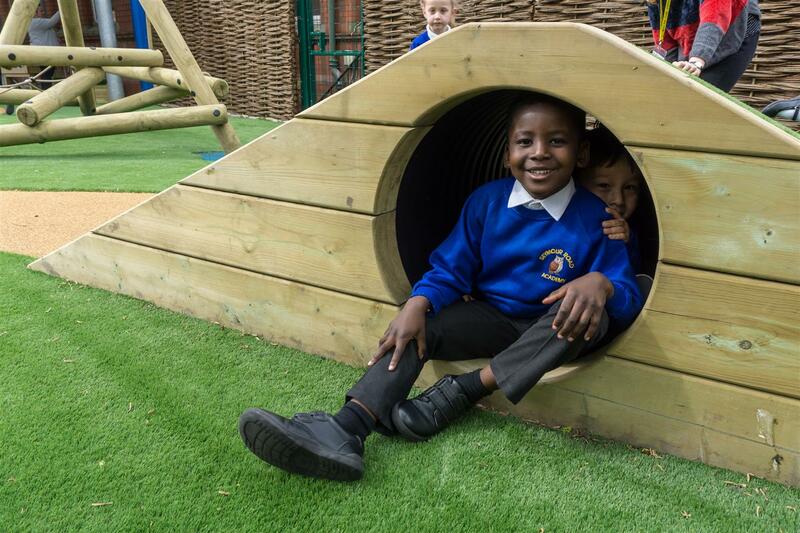 The school took to social media to show some great photographs of the new space, which has already been promoting creativity and curiosity among the children. 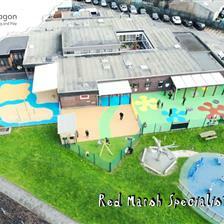 There have been many positive comments from parents. 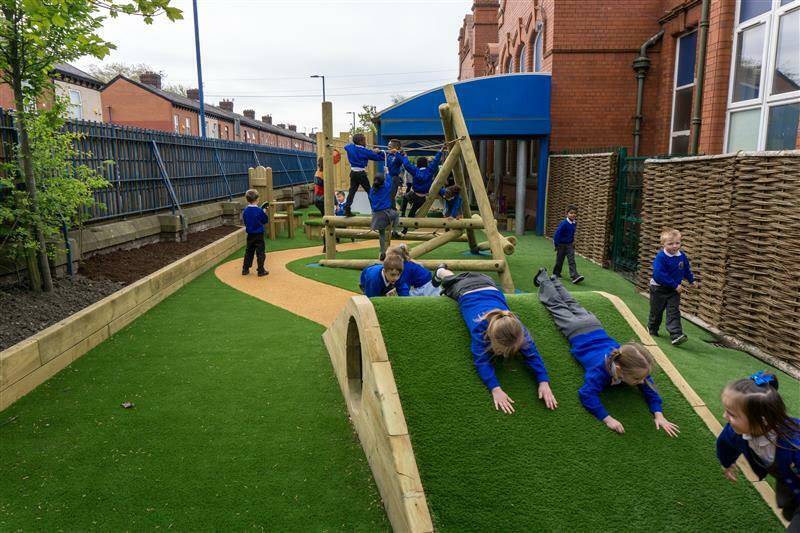 Are you contemplating improvements or even a whole scale redevelopment to your school’s outdoor space? Please do not hesitate to Contact Us for a free, no-obligation consultation. 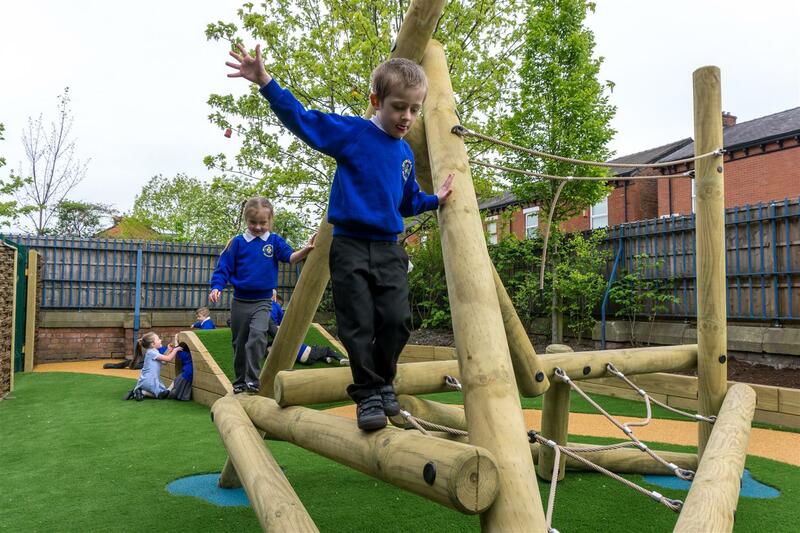 You can view Pentagon’s full range of outstanding early years outdoor play equipment by visiting our dedicated EYFS Page. © Pentagon. All images and information on this website are the intellectual property of Pentagon Sport Ltd.
Unlicensed use infringes copyright law.